Seattle, originally by Blinking Charlie. So the idea was simply to open a bar. Everything has gotten overconceptualized these days… The only thing that we want to do is have fun at what we do. I’ve always been SHOCKED by how many eating/drinking establishments forget what the basic function of their business is: hospitality… It happens all the time and we don’t want that to happen to us. Be kind, be courteous, be attentive, be fun. That’s it. We will, from time to time, have a DJ or do something wacky, or throw a fun party, but the foundation of the concept is to host a good time for all every day—which isn’t a concept at all. I’m so excited to work with my homies and get my friends faded! The Stranger’s Bethany Jean Clement got the details on the “Big Fun” project — under construction directly below the Stranger offices — from Patric Gabre-Kidan formerly of the Book Bindery and the Ethan Stowell empire. We’ll talk to Gabre-Kidan as the 11th/Pine project comes along to learn more and see if he’s settled on a name for the bar yet. Mallet is handling the buildout. From the permit end of things, it looks like things are just getting started so you might have a bit of a wait before you’re able to check the new place out. Meanwhile, the Stranger is in the middle of a recent re-up on its lease of the building’s upper levels while, below, telecommunications gear claims the basement. Across the street, the Sunset Electric development should open next year. Guessing this is a bar for underage teens? I’m glad I’m not the only one who doesn’t know what “faded” means. Me neither, but in context it must mean “drunk.” Great, a bar owner whose goal is to get his customers drunk!….really responsible….not! Wow. Another bar is like, so original. 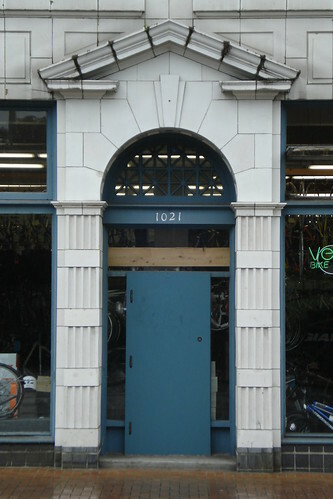 This is off topic, but did anyone ever notice that woman who was pretty much living in the side door of Velo all spring and summer long? I don’t see her anymore because the construction picked up I guess, but for months she was there EVERY TIME I walked or drove by, and that’s a lot. Any time of the day, she was there. I was always really curious about her. I mean, obviously, there are a lot of homeless people on Capitol Hill, but they tend to move around a bit. I hope she’s okay, wherever she is. She is still here, just other side of the block. She is usually in a doorway across from Café Vita. Agreed, plenty of homeless folks around, but she seems out of place. Oh please, what do you guys want to go in there, a bank? What other business can afford CH rents? Also, have a sense of humor! Hard to have a “sense of humor” about an over saturation of bars in a neighborhood that could use (and wants) a greater collection of useful businesses so people don’t have to drive somewhere else for everything except getting drunk. i dont have a car and it works out ok for me. I hope it doesn’t attract more douches to the hill, but lets be honest, it probably will. Damn! I was hoping for a Chase™ bank. I normally get my banking done in the former Twice Sold Tales, Easy Street Records, or Costas Opa’s Greek restaurant, but sometimes I just need a Chase™ ATM on Cap Hill™ as well!